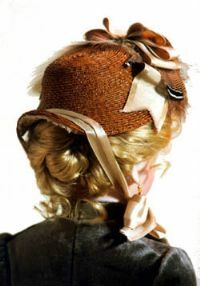 This Lady doll straw hat has a brim turned up in the front and back which may be trimmed with ruched net, a pleated satin ribbon across the back brim which comes around and ties to keep the bonnet in place, and a looped bow and feathers trim the crown. This hat fits a 22-24 inch Lady doll with a head circumference of 10-11 inches. Also available for size 9-10" head circumference as well as the Ultimate Fashion © Doll or 12" French Fashion Doll. Sold separately or as part of a kit.